Mircrosoft does not make random phones calls. 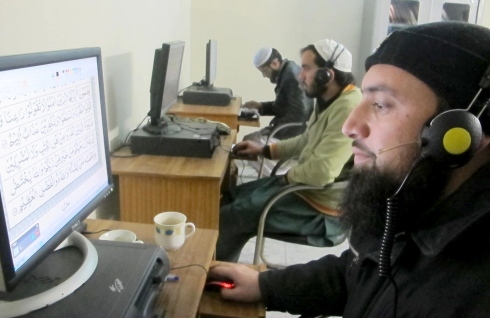 These people call to get your PERSONAL information to support ISIS financially. If they CALL YOU, HANG UP IMMEDIATELY. being monitored by your carrier, the NSA and the FBI. to the FBI & NSA so they can monitor their physical address, then Hang Up ! Next Clean out your cookies and cache in each browser you have used. Simply go to your browser look in the right corner for an icon that shows three vertical lines. Click on these lines and a pop up will appear. Look for "Settings" or "History" and click on that. You should see a list of things on your browser. Click on the tab that says "Clear Browser". Next "Reset your modem" from your internet provider. Usually you can do this by pushing a button on the back of the modem they provided. Note: some modems have a button on the front. If you do not see this button contact your internet provider for the location of this reset button. Last, go back to your Desk Top or Lap Top, and do a restart. This should clear the current connect that these crooks used to get in your computer. Unfortunately unless you have multiple super firewalls they will find a way back in. Hopefully some day the computer industry will design something that will block these IDIOTS forever. Until then the steps mentioned above are the only temporary solution you have. 'Can you hear me?' hang up immediately. Paul Marcarelli is not on the other line. For those wondering who Paul Marcarelli is, just watch any Verizon commercial from the mid-2000s, or any modern day Sprint commercial. He became famous for his six-word catchphrase, 'Can you hear me now? Good,' but now a variation of that very phrase is a go-to weapon for phone scammers. If you receive a call and immediately hear the phrase 'Can you hear me?' hang up. The phrase is used to coax you into saying 'yes,' a word that, if said in your voice, is as good as gold for con artists. Let's STOP ISIS before they steal from You ! You work hard for everything you have. We work hard to help you keep it. money due to identity theft, we'll replace it. Hackers are extending their service hours, guaranteeing their work and offering more of your stolen data at lower rates. Are you ready? Customer service is the motto. Registration on the USA Do Not Call List for telemarketers is at no cost. you must call 1-888-382-1222 from the phone number you wish to register. To register online, go to http://www.DONOTCALL.gov. You must have an active email address to register through the Internet so you can receive an email that is part of the registration process. Curious to see Who's Trying to Scam You ? Are You About to Fall for Yet Another Internet Business Opportunity Scam? on legitimate opportunities that I have found along the way. Business Scam or Worthless Venture ! # 1 Site to get the Scoop ! Saved By ScamXposer Users Since July 2006! Over the years, wire transfer has been the method of choice for fraudsters looking to get paid by their victims. Recently, however, there has been an uptick in consumer complaints to Fraud.org reporting that scammers are requesting the use of Green Dot MoneyPaks or Vanilla Reloads. These payment methods mean untraceable cash for fraudsters. "The man called my place of business to say that my previous payment on my bill didn't go through and that my business's electricity would be shut off that day. ... He requested that we pay by Green Dot MoneyPaks. He even called me back to make sure I was going to pay it. He said I would get a call in 30 minutes from [the] reimbursement center for the card fees. I then realized that this was a scam and it was too late." Did you know that every year American consumers lose an estimated $50 billion to fraud? With your support, the National Consumers League's Fraud.org has helped millions of consumers avoid scams. You can help raise awareness and make a difference by donating to Fraud.org. Together we can protect consumers and prevent fraudulent scams from growing in the United States and abroad. Donate today. Want to teach the NSA "A THING OR TWO"? Want to know Who's Spying on YOU? Free tool that shows you who's spying on you. Real Time Messaging, Calling , Email and internet communications security service. Unseen brings consumers and businesses very strong secure and private communications. Our skilled and experienced team have been building popular web sites and services since 1995. Before starting Unseen, we developed Before It’s News, a leading source of alternative news and information. Because of this, we've had numerous people share with us their concerns about internet communications security. We've been aware of most of the recent revelations for years. Our premise is that everyone needs to be able to hear the truth so they can make a good choice for their future. If your communications isn't secure, it could be monitored, blocked or changed without you knowing it. That’s not good for anyone. Stop the Hackers before they HACK You !